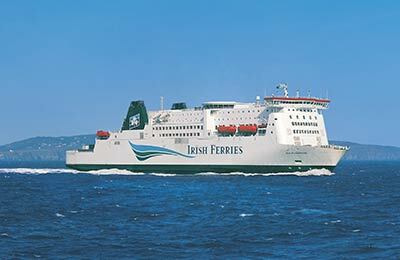 Rosslare Europort has sailings to Roscoff and Cherbourg in France, and Fishguard and Pembroke in Wales. Rosslare Europort is located at Rosslare Harbour on the south-east coast of Ireland in County Wexford. As well as sailings to Roscoff and Cherbourg in France, there are also daily crossings to Fishguard and Pembroke in Wales. Note: The village of Rosslare, also known as Rosslare Strand, is about 10 minutes away by car, but for the ferry you will need to follow signs for Rosslare Harbour. The village of Rosslare Harbour used to be known as Ballygeary, but became known by it's current name as it developed alongside Rosslare port, now known as Rosslare Europort. The port was first developed at the beginning on the 20th Century by railway companies who wanted to encourage steam ferry traffic between Great Britain and Ireland. Rosslare Harbour is a small village, with a supermarket, bank, hotels, guesthouses, pubs and restaurants. From Dublin, take the motorway M50 South, continue on the M11 and N11; take the exit; at the roundabout take the 2nd exit, at the next roundabout take the 1st exit onto Arklow Rd that continues as Main St; turn left at the R741/The Ave and continue for 42 Km; turn left at Commercial Quay/R730, then at the roundabout take the 1st exit onto the N25, after 7 Km turn left at R740 and continue the last 4 km toward Rosslare. Rosslare Europort is situated at the end of the N25 in Rosslare Harbour. "Rosslare Harbour" and ferry symbols can be found on all road signs leading to the port. The port is 20 minutes from Wexford town, 1 hour 20 minutes from Waterford city, 1 hour 45 minutes from Kilkenny city, 2 hours 15 minutes from Dublin and 3 hours from Cork. Disabled toilets and access are available at Rosslare ferry port, although we suggest you advise of any special requirements at the time of booking.